Tiil gool ghya, goaD goaD bola! Recipe for making tiil laddoos. More info on Makar Sankranti. Thank you Capt for your wonderful Wishes. Being so far away from home, it is difficult to participate in all our festivities. The biggest drawback of staying away from the matrabhumi. Happy Pongal Arun, M and m. The Ladoos look very tempting especially since I just got back from my aerobics class (from the gym at pitt). Yes! Viji – Happy Pongal too! Miss all the goodies! Anyways, off to india in a few weeks, so will have to make up for it. 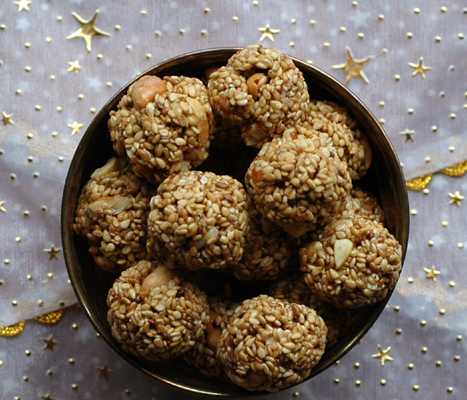 Thank you Poornima – where are the laddoos? And enjoyed visiting your site. Thank you Shantanu ~ I have added a link to your explanation of Makar Sankranti to the post above. thanks for hooking us up with charyl – can’t wait to feature her art! Also added this link to the main post – thanks for the tip. Woo Hoo! Ellina Unde! Looks perfect, I haven’t eaten those in a long time. Wish I was in India. Happy Shankranthi to your family. Wishing you and your family a fabulous Sankranthi! Try your local desi grocery store – they may have these laddoos! And so fabulous to have you back!